When I was first diagnosed with Hashimoto’s disease at 17, I thought I was completely and utterly alone. I thought of it as a rare, and mysterious disease that doctors couldn’t understand and no one could relate to. Little did I know that it was one of the most common autoimmune diseases that there is, and the number of people that have it is staggering and unreported. It’s estimated that over 14 million Americans have Hashimoto’s disease. Keep in mind that that’s just the US, and that’s only an estimation. 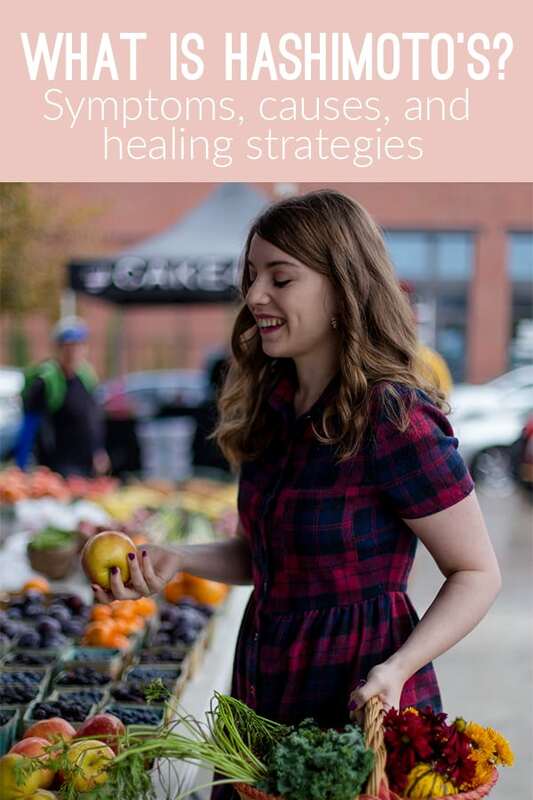 As the number of those with autoimmune disease climbs, it’s important to get a firm understanding of what this disease actually is, and get a grasp on how to heal it… because you can heal! Hashimoto’s disease is an autoimmune disease where the immune system attacks the thyroid gland as if it were a foreign invader. The thyroid gland is essentially our bodies thermometer. It regulates our temperature, our metabolism, and is crucial in the overall balance of our hormones. Typically, it’s characterized by hypothyroid symptoms and presentation. However, Hashimoto’s can present as hyperthyroidism and even swing back in forth in many cases, including my own. Getting a diagnosis can be easier said than done. It took nearly a year (that felt like an eternity) of debilitating symptoms for me to get a diagnosis, but in reality, that’s quite short considering how many people go decades without a diagnosis. The two main routes that you can get a diagnosis from a doctor include blood testing and a sonogram. The blood test tests the level of antibodies that your body is producing towards your thyroid. This test is called TPO and it’s crucial in a Hashimoto’s diagnosis. Most doctors will just test your TSH (thyroid stimulating hormone) which can tell you how your thyroid hormone is doing, but it doesn’t actually determine whether or not you have Hashimoto’s. You typically have to push your doctor to test your TPO, but it’s worth the effort! Another route that can help in diagnosis is a sonogram of the thyroid. This helps determine the amount of thyroid tissue that’s been destroyed. It’s also still a good idea to get a blood test, but this is another great option to ask your doctor about. The list of symptoms related to Hashimoto’s can technically be a mile long, which is why I wrote a separate blog post about Hashimoto’s symptoms explained, here. How exactly you get Hashimoto’s varies from person to person. However, the following three triggers are said to be a common thread in all autoimmunity. What are the lifestyle and diet factors? It’s important to remember that the real issue lies within the immune systems confusion, and not the thyroid gland itself. Thus, calming down the overactive and confused immune system is the real key to healing the body. So, how do you do that? Diet was one of the biggest factors in healing my own autoimmunity. The food that we eat has a huge potential to set off autoimmune reactions and inflammation. The autoimmune protocol is a healing protocol that has changed my life, as well as the lives of many others. You can learn more about this protocol here. But before we can fully understand the food piece, we have to get a handle on the gut. The gut is connected to everything, including our ability to develop autoimmunity. Having an unhealthy gut and intestinal permeability is one of the main triggers in developing an autoimmune disease as it creates confusion and inflammation in the body, and damages the immune system which lives in our gut. Working with a doctor is a huge factor in healing the gut. Another helpful resource is my e-book, The 30 Day Gut Healing Diet Plan & Guide which lays out more support for meals, recipes, and more. Struggling with finding a good doctor? I have a blog post about finding a great doctor here. Before we can make a physical change, we have to commit to a mindset shift. For years, I struggled to try to heal Hashimoto’s because I felt sorry for myself. It was only when I was able to shift my mindset and see myself as strong and capable to heal this was I able to really commit. Everyone is different, and no one case of Hashimoto’s is like the other. What brought your body to the point of autoimmunity may be entirely different than mine, and for that reason, you need to personalize your own journey. Read books on Hashimoto’s, work with a doctor, and listen to your body to find what works best for you. This is your journey and you have the power to take control!